To celebrate and appreciate the present, one must look back at the past. For over sixty years now, New York City has been blessed with free theater in Central Park through Shakespeare in the Park. 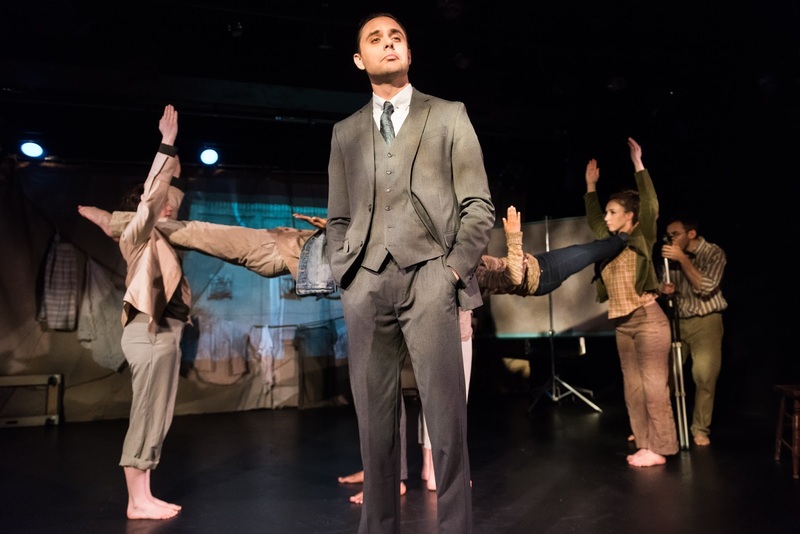 In the greatly ambitious The Battle of Central Park from Current Harbor, the public battle between city planner Robert Moses and theater artist Joseph Papp is explored through a narrative bio-dance piece with text by Andrew Massey and choreography from Annalisa Ledson. Using a plethora of texts as source material, The Battle of Central Park takes the audience back to the early days of the beloved Shakespeare in the Park when Papp hoped to continue to perform his work for no admission while Moses demanded he charge the audience a fee to help with the “upkeep” of the park. This showdown lead to an epic court battle where accusations of communism, the backlash of the public, and the ultimate creation of an iconic amphitheater reigned. The Battle of Central Park is a piece that is certainly educational in content but thin in execution. Playwright Andrew Massey does a wonderful job curating the information, leading to a fascinating exploration into two dominating forces but simply lifting quotes in narration form was passive. Adding in Annalisa Ledson’s movement and dance boosted the piece physically but it came at the expense of fine-tuned storytelling. The Battle of Central Park is not for the easily distracted. But for those who can capture it all, there is an interesting story deep within. The Battle of Central Park is all about progression. With movement driving the story, director Jamie Watkins relied heavily on stage pictures to display artistry. And there often were some striking images. There were times when it was a bit slow moving from vignette to vignette but when the beats moved fluidly into one another, that’s when The Battle of Central Park was at its best. Though there was an ensemble present to portray an array of characters, Watkins guided the two named personalities well. Jon Huggins as Robert Moses and Nick Trotta as Joseph Papp did an impeccable job at characterization. It’s evident that they did their homework. Huggins and Trotta went big with Moses and Papp highlighting diction, physicalization, and most importantly, personality. Because of the nature of the truth, it’s a shame we never saw Huggins and Trotta truly go toe to toe. The Battle of Central Park is a text and dance extravaganza. With that, this ensemble was filled with dancers and movers with not the strongest acting skills. The way the piece was broken up, each performer was granted moments of playing storyteller. It was clear who was truly up for the acting challenge, including Christine Pardos and Julia Schonberg. And with Shakespearean text dropped in, those who seemed more dance oriented suffered. From a production standpoint, Current Harbor did a phenomenal job transporting The Tank from black box space to the world of The Battle of Central Park. There was a clear color conceit from the show. With beiges and fall colors seeming to dominate the scenic elements and period-inspired costumes from Michael Minahan and Preesa Adeline Bullington, there was a clear vision. Using the backdrop alone would have been sufficient but the addition of the projection from Watkins and Minahan was a bit troublesome. The busy backdrop literally killed the images. If the images were important for story, it took some deciphering to make out specificities. And if your focus was on the projections it meant you weren’t seeing or hearing the story. It sounds contradictory to say but The Battle of Central Park longs for something active in order to get to the next level. The passive storytelling and busy movement didn’t quite service Moses and Papp’s story as best it could. The generalities are sweet but Moses and Papp are the meat.